These luscious Caramel Apple Cheesecake Bars with Biscoff Cookie Crust can be made ahead of time – a perfect dessert recipe for holidays or parties! Is everyone tired of apple recipes yet? I hope not, because these Caramel Apple Cheesecake Bars with Biscoff Cookie Crust are just too good not to enjoy RIGHT NOW! While all of the ingredients are tasty on their own – caramel, apple, cheesecake, Biscoff cookies – the sum of their parts is simply luscious. I can’t wait to add these Caramel Apple Cheesecake Bars to our list of Thanksgiving desserts this year. Don’t most people offer a couple different desserts for turkey day? We do, and, if you don’t, I totally think you should. Try these out as an alternative to the traditional apple pie. They also make an impressive indulgence for the non-chocolate or non-pumpkin crowd. 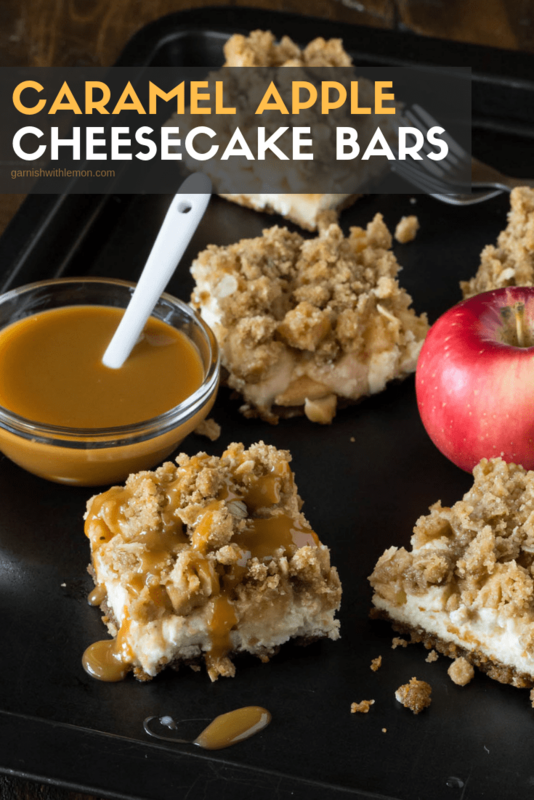 Can I make these Caramel Apple Cheesecake Bars ahead of time? The recipe requires that these bars be refrigerated overnight, so the answer is a definite YES! The cheesecake bars need that lengthy chill in the fridge to get nice and firm so you can cut them into pretty pieces. You can also freeze the bars without the caramel topping, then defrost and top with caramel before serving, which is great for those of us who like to get way ahead in the game. Do I have to make my own caramel sauce for these bars? No, but if you’re feeling ambitious, we have two very tasty salted caramel sauces – one with whiskey and another made with tahini. 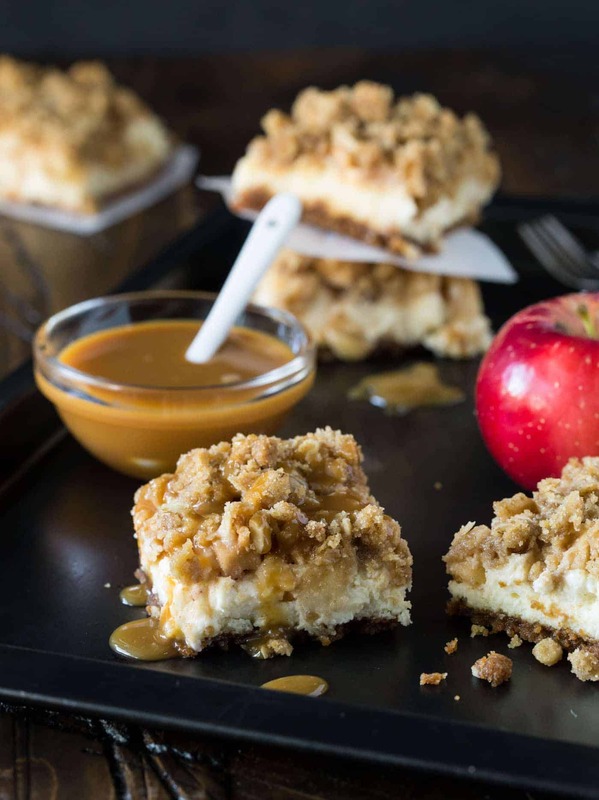 Is there a certain type of apple I should use for these Caramel Apple Cheesecake Bars? I prefer a tart apple like a Granny Smith or sturdy baking apple like a Haralson to offset the sweetness of the rest of the cheesecake bar, but feel free to use the type of apple you have on hand if it means you don’t have to make an extra trip to the store. Additionally, the type of cut for your apple isn’t really important. You can either chop your apples into small pieces if you want a chunkier bar (as I did) or slice them thinly like you would for pie. Not a fan of Biscoff cookies. Can I substitute graham crackers instead? Of course you can! I’ve had great success using both graham crackers and gingersnap cookies in lieu of the Biscoff cookies. Once again, I love my USA baking pans, and this 9 x 13” model is no exception. Plus they always clean up beautifully. No, you don’t have to use Biscoff cookies in this recipe, but they sure are tasty! This nonstick foil is fantastic! It doesn’t stick to anything and is great to have on hand for recipes that require an easy release. This apple corer really does save time when you’re trying to chop or slice a boatload of apples. I use these y-peelers for everything from apples to squash. Super sharp, though, so watch your fingers! You can cut these Caramel Apple Cheesecake Bars into whatever size you like – perfect for a dessert buffet. Feeling gluttonous? Serve sizable pieces. Totally stuffed? Slice little slivers. Have a flair for the dramatic? 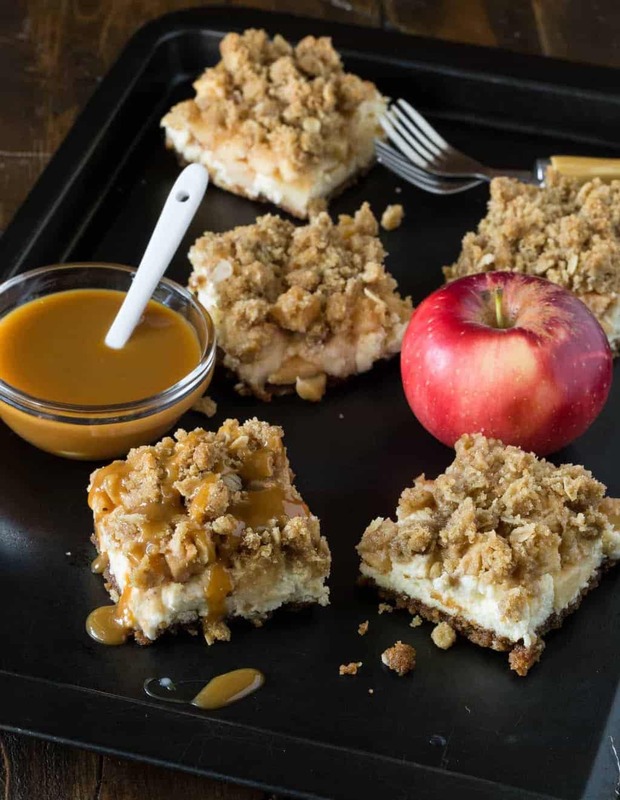 Plate individual portions of these Caramel Apple Cheesecake Bars and serve the caramel sauce table side. However you serve these bars, they are sure to disappear quickly. Love cheesecake? We do, too. Don’t miss some of these other luscious cheesecake desserts! A pan of these delicious Caramel Apple Cheesecake Bars is always a hit at parties. Make a batch today for your next potluck! Line a 9 x 13 baking dish with foil. Gently grease foil. Combine cookies, 1/4 cup sugar and ? cup melted butter in a small bowl. Gently press into bottom of baking dish. Bake for 12-15 minutes. Remove from oven. Set aside. Using a mixer, beat cream cheese and 1/2 cup sugar together until smooth. Add vanilla and eggs, one at a time, mixing well after each addition. Pour mixture over warm crust. Combine apples, 2 tablespoons sugar, cinnamon and nutmeg together and sprinkle over cream cheese mixture in pan. Combine brown sugar, flour, oats and 3/4 stick butter in another bowl and sprinkle over apple mixture. Return pan to oven and bake for approximately 30 minutes or until filling no longer wiggles. Allow dish to come to room temperature, cover and refrigerate at least 8 hours or overnight. Grasp edges of foil and lift bars out of pan. Cut to desired size. Serve with warm caramel sauce. Oh my. I love anything with biscoff! And these are gorgeous! I’m with you, Aimee. Biscoff = YUM! These look so yummy! I love the apple caramel in a bar! Do these keep well? Can you make these ahead? I have a dinner Sunday, but was hoping to make these Thursday evening as I won’t have time to prepare them after then. Hi Aly, You can certainly make these a few days in advance. Keep them in covered in the fridge and add the caramel right before serving.